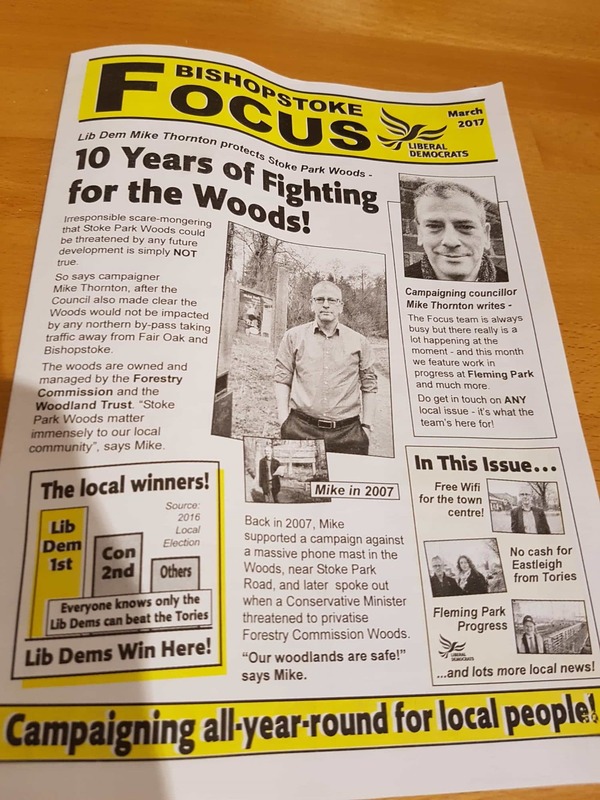 Threat to Stoke Park Woods: Can the Lib Dem ‘Focus’ newsletter be believed anymore? ADD UPDATE, 16 March 2017: Action against Destructive Development is fiercely politically neutral. We may nonetheless speak out if a politician makes a statement that seriously misleads the public – regardless of which party they represent. Such is the case with the latest Lib Dem ‘Focus’ newsletter in Bishopstoke. The March ‘Focus’ assures residents that options B and C, namely plans to build thousands of houses and a road between three stretches of valuable ancient woodland known collectively as Stoke Park Woods, will not damage the woodland, which is much loved and well used by residents. Focus accuses people who say otherwise of “irresponsible scaremongering”. However, the newsletter makes no mention of a warning from the Woodland Trust (which exists to protect woodland) that the plans, should they go ahead, would be “hugely damaging” to the woods. The two statements cannot both be right. To help the editor of Focus, Mike Thornton (the former MP for Eastleigh), clarify matters we have asked him three simple questions. 1) Was he aware of the Trust’s warning when the Focus newsletter was published? 2) What contact has he had with the Trust? 3) What is his evidence for the assertion that the plans would cause no damage to the ancient woodland? We will, of course, let readers know when we get a response. In the meantime, we publish below the Woodland Trust view and the Focus view (for the full version click here), so that people can make up their own minds who to believe. * Several Lib Dem Eastleigh borough councillors, including Keith House (the council leader), Vickieye Parkinson-McLachlan, Trevor Mignot and Derek Petty all gave such assurances at EBC’s last full council meeting in December. Your ticket for the: Threat to Stoke Park Woods: Can the Lib Dem ‘Focus’ newsletter be believed anymore?